Having a big air compressor is great to have in your garage in case you need a little extra power to get a job done. But with that said, I believe that everyone needs to own a pancake compressor. 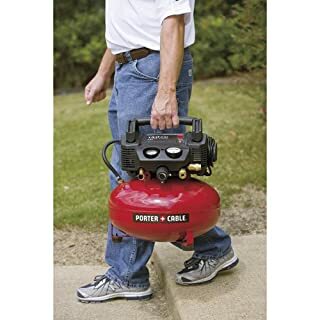 Not only are they almost as powerful as a standard size air compressor, but they are lighter and easy to move around. I spent a lot of time researching different brands and models of air compressors, and I have to say that I believe I found the perfect one. Anyone who is in the market for a pancake compressor should consider the Porter-Cable C2002-WK Pancake Compressor. 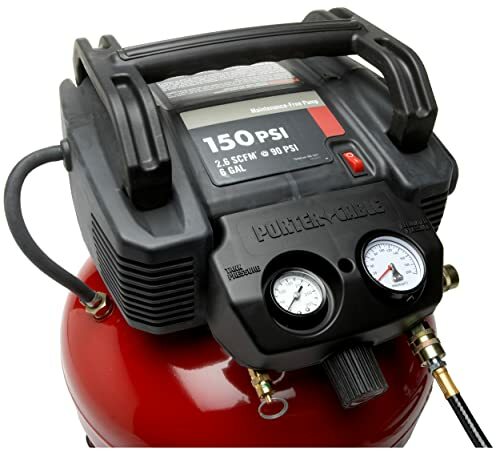 The compressor weighs about 34-pounds and has a maximum psi of 150. The compact design allows you to store it virtually anywhere in your shop or garage without it cluttering up the area. If you need air pressure in a variety of places, or if you’re like me and just don’t want to invest in a big and bulky air compressor, then you’ll love this pancake compressor! How Does it Compare to Other Pancake Compressors? Who is This Pancake Compressor Made For? What Makes This the Perfect Pancake Compressor? 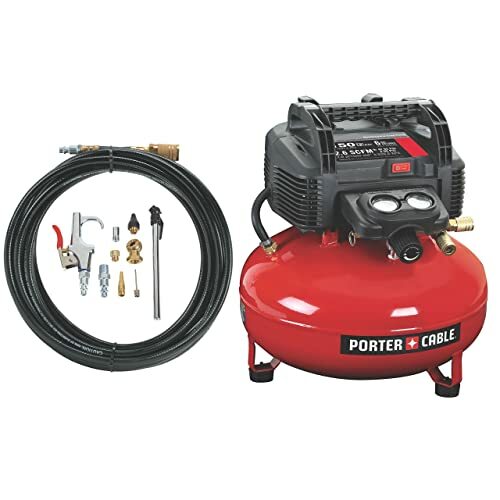 In addition to getting a high quality air compressor, you also get some pretty useful accessories to go with the Porter-Cable C2002-WK Pancake Compressor. It comes with a 25-foot nylon hose, a blowgun with some attachments, tire gauge, tire chuck, plugs, quick coupler and Teflon tape. It’s possibly the most porter cable pancake air compressor you can find, with the dimensions being 18.3” x 18” x 19”. I also like the induction motor that features a slow start, so you can increase the life span of the compressor, while also increasing the performance during use. After reading several reviews of the Porter-Cable C2002-WK Pancake Compressor, I was convinced that I needed to do a break-in procedure before I used it. I was surprised to find out that this procedure wasn’t in the instruction manual, since most of the people that bought one said it was essential in order for it to work properly. The break-in procedure I used was pretty simple. I basically opened the valve so that no pressure would build up. I turned on the compressor and let it run for about 15-20 minutes while the air went through the valve. Once that time passed, I closed the valve, allowed the pressure to build up and then used it. I’m not sure what would have happened if I didn’t use this procedure, but I can say that I’m glad I won’t find out, because the compressor works perfectly for me now! I’m definitely not a professional handyman, and I don’t use my pancake compressor every day. But every time I have needed to use this compressor, it has worked perfectly. I filled up my tires on both of my vehicles quickly and easily, as well as bicycle tires. I’ve also used it to blow dust off of the shelves in my shop. I did try to use my nail gun with it one time, but it didn’t work too well. The ¼” hose that is supplied with the compressor simply isn’t big or strong enough to handle that type of pressure. However, I am completely confident that the compressor would be able to handle using a nailer. You will just need to buy a larger hose to put on it. When you’re doing light jobs around your house, there isn’t a better pancake compressor available, in my opinion. I can’t speak for professionals who use air compressors daily, but it wouldn’t surprise me if they had similar compliments for it. One thing that I’ve noticed is that my Porter-Cable C2002-WK Pancake Compressor is almost as loud as my larger full size compressor. Pancake compressors are generally quieter because of the smaller size and air capacity, but this one is pretty loud. I guess the added noise means it is more powerful than the others, but don’t expect to be getting a quiet compressor with this one. I would say that anyone who needs a small air compressor for their shop would benefit from having the Porter-Cable C2002-WK Pancake Compressor. In fact, if you’re just planning on doing small jobs like airing up tires and maybe using a nail gun occasionally, then you may not even need to spend money on a full size compressor. Also, if you do a lot of traveling, it is easy to lift and load this compressor in the back of your truck. In fact, I take my compressor everywhere with me. You never know when you are going to have a flat tire, or if you might be able to help someone out that has one, so it’s better to be safe than sorry. I think I speak for a lot of people when I say that this is the perfect compressor because it runs efficiently and doesn’t require any maintenance. Since it is oil-free, there’s not much of anything that you have to do to keep it running. As long as you take care of it and use it properly, you should be able to have the Porter-Cable C2002-WK Pancake Compressor in your shop for many years. The small and compact design makes you think it isn’t that powerful, but the power that it puts out is quite impressive! Out of the hundreds of reviews that I read about the Porter-Cable C2002-WK Pancake Compressor, I probably only read a handful of negative reviews. After using the compressor for a short period of time, I can honestly say that I agree with the vast majority of the positive reviews, and think that the people that wrote negative reviews weren’t using it properly. For a price of Currently Not Available*, there isn’t a better bargain available when it comes to quality pancake compressors like the Porter-Cable C2002-WK Pancake Compressor. Power and portability are two of the main features that people need in a pancake compressor, and this one excels at both. For a minimal investment, you truly can’t go wrong with buying this pancake compressor, so don’t delay in getting yours today! This is the Porter-Cable C2002. You can click on following link to get more information about PORTER-CABLE PCFP02003 , a similar product.